Generational differences: James Fritz’s play for the National Youth Theatre explores society’s attitudes towards the old. The Fall, Southwark Playhouse. Photo: Tristram Kenton. Young people have always struggled to empathise with the old. How could they not? At each stage of life, we look back to the previous one and marvel at how quickly our perceptions and priorities have transformed. It’s becoming responsible for your own income, your own living arrangements, having children. It’s seeing the failure of other people’s moral compasses, and the failure of political ideas, and becoming more or less patient with it all. It’s the changing levels of hormones in your body and the function of your musculoskeletal system. But the rate at which our society is evolving is only making this more pronounced. We have kids growing up today who can’t understand non-touch screens, and yet the last living person born in the nineteenth century, Emma Morano (from Italy), died only last April. 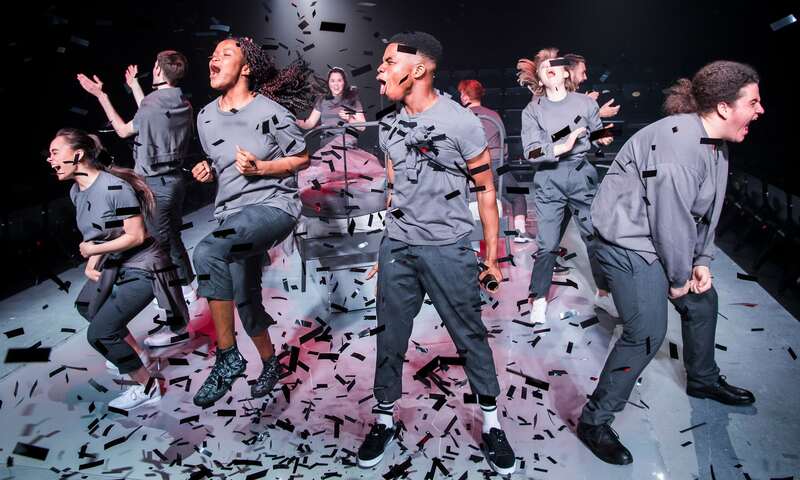 Add in our ageing population, with the numbers of octogenarians set to go through the roof in the coming decades, and the subject matter of James Fritz’s play for the National Youth Theatre becomes incredibly compelling. It moves through three scenarios, implied to trace the life of the same female character. In the first, a pair of teens (Jesse Bateson and Niyi Akin), looking for a private place to enjoy each other’s company, let themselves into the house of an old man the girl sometimes helps out. After they discovering the man lying on the floor – alive, but immobile – a tense dispute begins, revealing the anxieties and half-formed ideas of both characters. Bateson and Akin have a great comic rapport, and Matt Harrison’s direction brings loads of energy, wit and drama to the story. Luckily, the other eight young actors are just as compelling. In the second segment, the pair – now played by Sophie Couch and Troy Richards – have a son, while the man’s mother suffers a fall, resulting in him having to leave his job to look after her. Ultimately, they face an agonising situation of trying to care for the elderly woman, while making sure they have a roof over their heads. The dialogue in this section is like a montage of their lives together: it’s in the form of a normal conversation, but each response moves the story forward to the next key event, with weeks or months of their lives having elapsed in some cases from question to answer. It’s dreamlike, but gritty at the same time, and gripping. In the third scene, the woman (Josie Charles) is now alone, elderly, and has arrived at a facility where she is forced to live in close quarters with three others, of varying affability. But there is another option available to her: sign up for voluntary euthanasia, secure a compensation payment for her estranged son, and at the same time do a solid one for a society awash with old people needing care. It’s this last story, depicting the logical outcome of the values we see discussed in the previous two, that sticks in the throat. It’s a little glimpse of a faintly dystopian future that hits home because it doesn’t take things too far. The state’s potential for callous bureaucracy is a cliché, but here it’s used with nuance. What’s impressive about Fritz’s writing is that he manages to horrify with his vision of human coldness, and yet it’s not propaganda: it recognises that there are no simple statements to be made. And if there is, it’s of the intellectual bankruptcy of the politics of spending cuts, which lurks in the background as a perennial villain. The Fall is at Southwark Playhouse until May 19th. For more details, click here.